Since I got back to Holland, things haven’t quite gone according to plan. Well, let’s take a look at the list below. Okay, this one I have done. Definitely. It was literally the first thing I did when I got back. We threw a surprise birthday party for a friend at my place and it was great! I’ve kept my performance at an impressive level since then. Our conversations with friends would usually go like this: Party? Sure! Of course! Why not!? We actually have some pretty good stories thanks to our lovely mates: tequila, wine, vodka and so on. This one obviously didn’t happen. I was never the person who studies a lot, I just wasn’t. I was hoping that this term I would do the readings on time because that makes life so much easier. But I haven’t and now they’ve piled up. Yay!? I don’t mean writing essays because with that one, you don’t really have another option. You’re given a topic and a deadline and you just do the work. What I mean is writing in my free time, for myself, just because I enjoy doing so… Realizing that I haven’t sat down to write something in almost a month hit me real hard. Of course I’ve written small pieces but that’s not good enough. I haven’t grabbed my coffee, isolated myself from all the responsibilities just to write, to turn my thoughts into words. I even got myself a new sketchbook (with real excitement) but still nothing. When you’re bored you do sketch things but that’s… not the same. I mean really putting some effort in to it and working on it. Before I even got to Holland everyone was telling me how lucky I was and how much I would be travelling now that I’d be in Europe. Well, that didn’t happen. Here adventures and new discoveries are just a train ride away and I hadn’t been to Amsterdam in six or maybe even seven months. I’ve been to a few Dutch cities like Leiden or Rotterdam but that’s not good enough… Especially when there are so many places to see! Don’t worry, this will not be a post about me complaining about all the things I haven’t done! Eventually, reality hit me in the face. Real hard. I wasn’t living, I was just breathing, getting by. I realized that it was time for a change. I had to put my life back on track. Like they say, better late than never. It’s not easy to catch up with everything you have missed. For example I’m still postponing the readings… but that is because I am very busy trying to catch up with Spanish. While I’m going over the material of the first week, they are doing week #4 and since all the grammar and vocabulary is building up on each other, it’s a challenge. But I know that I’ll get there. Since I had this “Enlightening Realization Moment”, things have actually changed and I can see that I am getting to a better place. The other day a friend told me that she was impressed with my performance this term and has been seeing me on campus more often. That comment made me really happy because I was trying and it was nice that my friends recognized this too. I’ve fixed the “Not Travelling Enough” situation as well. Once you get caught up in daily life, you sometimes forget to take a break and do something new, go somewhere new. Hopefully soon I will have a post about this incredible day trip I had with some friends. Writing… Well this post is the start of fixing that issue. I have many things to write about, many things I want to write about and this is only the beginning! So I think I’m right on track in general. I know that I am taking small steps but I am getting there and that is just a great feeling. The warmest of all hugs to all the amazing people I have around me, who have been supporting me and giving me the motivation in this process of change! Cheers! And if there are any things in your life that you would like to change, start now! It’s the beginning of spring here, flowers are popping up everywhere and it’s the perfect time to do a “spring cleaning” in your life! 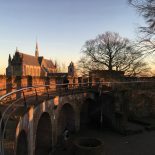 This entry was posted on March 6, 2014 by admin@theleidener in Ecesu, Leisure, Study, Travel and tagged Ecesu Erol, getting back on track, spring, studying, travelling, writing.